Much to the usual changing panorama of Vietnam—–where sleek skyscrapers compete to reach the heavens and scooters run riotous on its hawker-filled streets, a small town that hugs the south central coast named Hoi An is wonderfully trapped in a dreamy landscape of bygone centuries. Hai Pho or Faifo as it was once called, savored the splendor of wealth in Asia as the biggest trading port that controlled much of the spice trade, textiles, gems and ceramics. In its time, between the 16th to 19th centuries, seafaring merchants considered it as the most umbilical commercial artery of Asia to the rest of the world. Ancient exporters from China, Japan, India, England, France, Portugal and Netherlands all came to establish trading missions with the Vietnamese under the feudal leadership of the Nguyen Lords in the late 16th century. Over the course of its centuries of mercantile relations, they left enviable imprints of wealth and deep influences on its architecture, culture and lifestyles. But its economic luster faded as the Nguyen Dynasty crumbled into insignificance by the end of 18thcentury when the Tai Son rebellion crushed the dominance of the imperial lords. Soon thereafter, the mouth of Thon Bu River silted making it impassable for galleons to sail and moved the port to the nearby city of Da Nang. Then, this once wealthy town found itself slowly consigning into oblivion. For hundreds of years, Hoi An was left in the cold, seemingly nonexistent and held on to what were left of its dwindled fortune. But out of its desolation, surprised the world in the 1990s with a blinding comeback into fame with its antiquities as its new gems. The foreigners come marching in droves but not as traders but as tourists. Silk, handicrafts, jewelry and food are also back into business but not anymore through the galleon trades but are locally produced. Hoi An once again saw its town redeeming the glory of its once opulent past, not only by a fluke but also by the hardwork of its people. Strategically located in the middle of Vietnam, this laid-back town offers a refreshing break from the scramble of Ho Chi Minhand Hanoi. In 1999, Hoi An reaped a UNESCO World Heritage Site distinction as the most preserved ancient trading port in Southeast Asia. The well laid-out streets are decked with buildings strongly showing its ancestry and the merging of cultural influences of its trading history with various nations. The fusion of Chinese, Japanese and French architectural styles are the prominent buildings lining up on its narrow alleys. Wooden houses topped with arching tiled roofs stand side-by-side with concrete European edifices in fading mustard yellow walls and blue shutters. The ostentatious gilded works in Chinese temples beautifully balance the simplicity of Japanese bridges. The magical dragons on its roofs start to fade into the horizon as light begins to harbor. The heritage town shines into magnificent illumination of dangling and floating lanterns like millions of fireflies flickering in the dark. Aside from its refreshing bucolic ambience, Hoi An is also best known for its finest made-to-measure suits and dresses in no time. As tourists come by the cloud all year round, it has also become one of Vietnam’s culinary Mecca boasting of exquisite eastern and western flavors with infinite choices of restaurants and pubs. 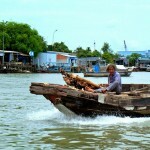 Some things put Hoi An significantly different from the rest of the cities in Vietnam. Scooters are not allowed in the heritage village. Honking is also muted and may only be used when necessary. While there are bars and pubs around, party music are kept at tolerable decibels and must not go beyond 12 midnight. Go boisterously wasted or be busted! This ancient town also brags about its long stretch of white sand beaches that hem its coasts. An Bang and Cua Dai are just two of the famous short getaways frequented by tourists and locals. If the city beach bores you, taking it across into the East Sea and let the exciting Cham Islands fill your fancy of beach wanderlusts. Hoi An’s renaissance of splendor owes it greatly to its history and fate of neglect. Today, it shines beautifully as its lanterns. Like its antiquity, Hoi An must be cherished and lived one day at a time. There are no direct trains or flights to Hoi An. 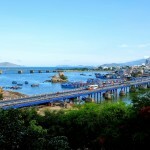 The nearest station or airport is in Da Nang, about 31 kilometers north. 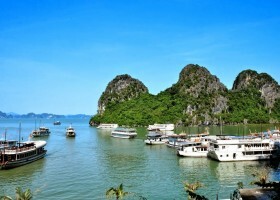 Buses going to Hoi An are conveniently available from any parts of Vietnam. There are no hotels inside the heritage village. As choices of accommodations define your atmospherics of vacation, in Hoi An, either you choose hotels close to the heritage village or to the beach. The closer you are to the Old Town or to the beach, the more pricey it becomes. Budget accommodations are normally located near the bus terminal or within the residential areas. Family-ran guesthouses are the popular choice of backpackers. Best buys in town are fine textiles, beautiful lanterns and ceramics, made-to-measure apparels and leather bags. Restaurants along the riverbank are quite expensive, ranging from $5 to $15 per meal. Pubs and bars on the riverside sell fresh craft beers for as low as $1. Getting around Hoi An is best on bicycle. You may rent motorbikes but these are not allowed within the heritage village.